This presentation was given May 15, 2013. A video is available. 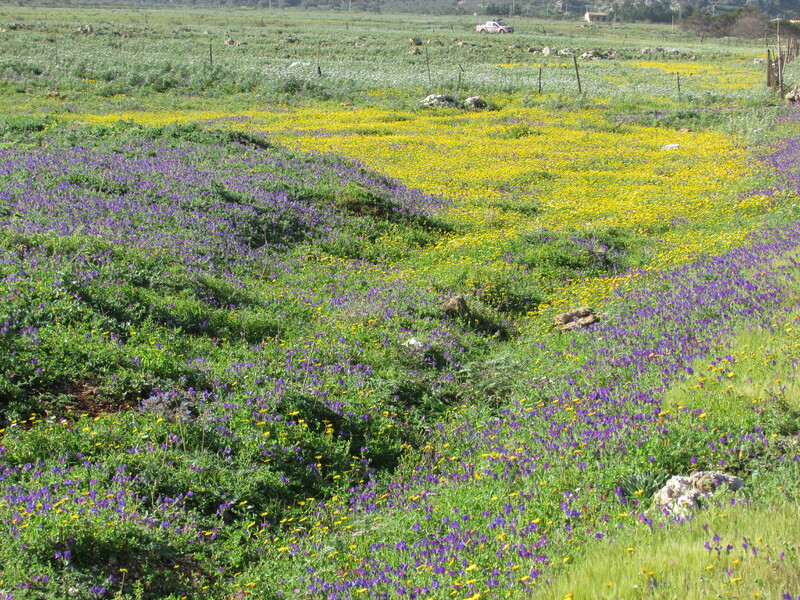 When we step into the sunlit valley that Luke paints in his Gospel, we find ourselves standing in the midst of the bright and colorful spring flowers that grow wild across the Galilean hillsides, filling our sight with welcoming vistas and bedewing the air with entrancing aromas. Luke’s skill in sketching Jesus’ ministry is not lost on us. But Luke is offering more than a pretty picture. With carefully measured brushstrokes, guided and refined by careful research—“having had perfect understanding of all things from the very first,” as he reminds us, which means “because I have examined everything carefully,”—he hands to us a painting that captures in its hues and textures the majestic sweep of Jesus’ ministry, both mortal and post-mortal. Let us sample a few vignettes from Luke’s account. At almost the exact middle of his Gospel, in chapter 12, Luke writes this line from Jesus’ lips: “Consider the lilies how they grow: they toil not, they spin not; and yet I say unto you, that Solomon in all his glory was not arrayed like one of these” (12:27). Jesus’ saying intrigues us because it sits in a context of worrying about the goods of this earth and is coaxed out of him by a follower who, anxious about his earthly property, begs Jesus to “speak to my brother, that he divide the inheritance with me” (12:13). In response, Jesus sets out a number of illustrations that, from an eternal viewpoint, anchor this world’s goods in their proper place: “The life is more than meat, and the body is more than raiment”; “how much more are ye better than the fowls?”; “how much more will [God] clothe you, O ye of little faith”; and “a man’s life consisteth not in the abundance of the things which he possesseth” (12:23, 24, 28, 15). At the crown stands Jesus’ all-encompassing statement, “Seek ye the kingdom of God; and all these things shall be added unto you” (12:31). For me, I wonder what it was like for the man Luke to write these lines. After all, he is an educated, likely well off, Greek-speaking convert who enjoys the goods of this world—if not in abundance, then in good measure. But he has now turned to the Savior and repeats what his new master says about property and money in story after story. We need only think of the parables of the prodigal son, the unjust steward, and the widow and unjust judge, among many others. All of these, which are preserved only by Luke, have to do in some way with financial matters. Yet Luke faithfully reports Jesus’ words. In a way, these sayings mirror Luke’s new scale of values. What is important to him before his conversion now possesses less worth. In effect, he bears his testimony through Jesus’ words about eternal verities in contrast to those of this world. As we know, Jesus’ concern about the grip that this world can clamp on us is only one of dozens of doctrines and principles that he gives voice to during his ministry. Let us continue by briefly examining Jesus’ views on women. After repeating the story of the bent-over woman whom Jesus heals in a synagogue and calls “a daughter of Abraham,” an expression that boldly underlines her innate value as a member of her society (13:11–17), Luke quotes two short parables that seem to be mere illustrations about the nature of the kingdom of God. The first has to do with a man who plants a mustard seed in his garden that sprouts into a tree wherein “the fowls of the air lodged” (13:18–19). Then comes the thunderclap. “And again he [Jesus] said, Whereunto shall I liken the kingdom of God? It is like leaven, which a woman took and hid in three measures of meal, till the whole was leavened” (13:20–21). The illustration does not appear to be particularly remarkable except to say that the woman is obviously preparing for a ward dinner because the total weight of the meal or flour that she is preparing is about fifty pounds. The surprising dimension comes in Jesus’ appeal to a woman’s activities as an illustration of what the kingdom of God is like. Here he pairs a customary action of a man (planting) with that of a woman (preparing food to cook) as illustrations of his Father’s kingdom. The message? Both men and women are welcome in his kingdom—on equal footing, no less. This view stands against the legal and social history of much of the Ancient Near East, whose laws and customs typically are weighted to favor men. As a side note, Luke pairs stories of a man and a woman throughout his Gospel narrative. The pattern is not accidental. We note in passing the angel’s visit to Zacharias and then to Mary; we observe the coming of Simeon to Mary and Joseph in the temple to see their infant son, and the coming of Anna; we behold Jesus healing the centurion’s servant and then, a day later, the widow’s son. And so it goes. But matters don’t end here. In Jesus’ response to the Sadducees’ question about the resurrection, he points to “the children of this world [who] marry and are given in marriage” (20:34, also verse 35). The verb translated here as the passive “are given in marriage” actually stands in the Greek middle voice, not passive. The proper sense is “to allow oneself to be married” and it applies specifically to the bride. With such a declaration, Jesus elevates women to full participants in marriage decisions rather than, as is customary, to be “taken” by bridegrooms from parents or guardians, potentially circumventing their desires. From a half-dozen other passages, let me settle on one further illustration from rather early in Luke’s Gospel. At the beginning of chapter eight, Luke summarizes Jesus’ activities with the Twelve: “He [Jesus] went throughout every city and village, preaching and shewing the glad tidings of the kingdom of God: and the twelve were with him” (8:1). Next in position of prominence, just after mentioning the Twelve, Luke writes that “certain women which had been healed of evil spirits and infirmities, . . . and many others [feminine], . . . ministered unto him of their substance” (8:2–3). One important point is that Luke names three of these women; the much bigger point is that he places his notice of these women next to his notice of the Twelve. From all appearances, these women are part of the larger entourage that is following Jesus as he travels around the countryside. But they are more than mere hangers-on. Luke writes that they “minister” to Jesus, a strong verb. Moreover, by Luke’s reckoning, they enjoy a place next to the apostles. What is more, these women go with him to Jerusalem for the last time, prepare spices for his proper burial, meet the two angels who declare Jesus’ resurrection, and serve as messengers to the Eleven. Important? Yes. Luke’s account almost screams in our ears about these faithful, worthy women whom Jesus treasures and loves. Let us now turn to families. We start with the simple word “house.” This term both in Hebrew and Greek points to the physical structure as it is built. We hear Jesus’ words at the end of his Sermon on the Plain: “Whosoever cometh to me, and heareth my sayings, and doeth them, . . . He is like a man which built an house, and digged deep, and laid the foundation on a rock” (6:48). Naturally, as we read these lines, we think of a house built firmly on bedrock. But there is more to consider here. The word for “house” in both Hebrew and Greek carries the extended meaning of the household, those who live in the home—that is, the family. Hence, on one important level Jesus is talking about families who are dug deep and rest on bedrock. I have counted no fewer that thirty-four instances in Luke’s Gospel in which Jesus’ words touch directly or indirectly on the family. Let’s try another example. At a Sabbath dinner gathering in the home of a prominent Pharisee who invites other guests, Jesus notices a jostling for the best positions for reclining at the low table. He then offers a lesson on manners: “When thou art bidden of any man to a wedding, sit not down in the highest room,” or most prominent place, but “sit down in the lowest room.” From this place, he says, perhaps the host will invite the guest to a more prestigious spot at the table. Fine. So how does this scene touch families? It lies in the fact that Jesus appeals to a wedding scene to make his point rather than to a dinner party where he and the others are reclining at that moment. At a wedding, which shapes the beginning of a new family, one’s manners should be at their best. Thus a family setting fixes the standard and tone for how people ought to behave as guests, does it not? Treating families invites us to talk about children. Of course, we see the obvious, for instance, the story of Jesus raising the son of the widow in Nain and the account of him offering blessings to children (18:15–17). In this latter instance, Jesus drives home three points. The first two arise in his initial words, “Suffer little children to come unto me, . . . for of such is the kingdom of God” (18:16). Of course, he welcomes children at his side. His disciples, acting as adults, occasionally will order the children to stay away from the great man. The disciples evidently worry that the children will make nuisances of themselves. But Jesus is not bothered by them. Quite the contrary. In his second observation, he declares that his kingdom will be filled with childlike persons—“for of such is the kingdom of God.” Here we come across his lofty valuation of children. They form the benchmark for membership in his kingdom. Jesus’ third point is much like his second, driving home his insistence on childlike qualities: “Whosoever shall not receive the kingdom of God as a little child shall in no wise enter therein” (18:17). Here Jesus’ emphasis falls firmly on how we receive the kingdom and its good news. We are to receive them as children do, that is, exercising our trust in God and warmly embracing him and his work. In a word, children set the standard for adults. Hence, we see plainly their intrinsic worth in the Savior’s eyes. Turning in a different direction, we come upon one of Jesus’ fiercest sayings, this one directed at scribes, the intellectual custodians of the Mosaic Law: “Beware of scribes,” he warns, “which devour widows’ houses” (20:46–47). No one knows exactly what Jesus has in mind as he repeats these words because he says no more on the subject. But some possibilities, even probabilities, present themselves. The first has to do with the Mosaic prohibition that Israelites not purchase property belonging to people outside the family. Under law, no person is to speculate in real estate because such property is deemed an inheritance from God (see Ex. 20:17; Lev. 25:23; Deut. 19:14; Isa. 5:8). We listen to the vivid reminder from the prophet Micah, who lays accusation against those who “covet fields . . . and houses” and force “the women of my people . . . from their pleasant houses” (Micah 2:2, 9). Second, Jesus’ words acknowledge that a problem exists within the society that needs fixing. The mistreatment of widows is an old problem, as earlier prophetic complaints show (see Isa. 1:17, 23; 10:2; Jer. 7:6; Zech. 7:10; etc. ), and a proper response to their plight remains a concern even in the earliest church (see Acts 6:1; 1 Tim. 5:3; James 1:27; also D&C 83:1–6). Significantly, Jesus’ sympathetic interest continues among his followers. Third, and most intriguing, Jesus’ pointer to mistreated widows raises into view his concern for families, particularly families in distress or difficult circumstances, because the Old Testament has always associated the well-being of widows with the fatherless and orphans, insisting in places that the mistreatment of widows and their fatherless children will bring a violator into the punishing hands of God (see Deut. 10:18; 14:29; Ps. 146:9; Jer. 22:7; Ezek. 22:7; etc.). We can make a similar case for the story of Jesus watching the poor widow who brings her “two mites” into the temple as a gift. Her pitiable situation affects very much her children who may be still living at home and certainly influences the opportunities, or lack thereof, that are open to them when they leave her home. On another level, her gift diminishes her ability to provide for herself and her children in even the most basic ways. Yet she gives: “she of her penury hath cast in all the living that she had” (21:4). Notably, only Jesus seems to notice this woman, whereas temple authorities will typically notice the others, those who “of their abundance cast in unto the offerings of God” (21:4). Among a host of other principles and doctrines, let me turn to a final observation that is only distantly tied to what I have said so far. One of the most puzzling omissions in the four Gospels has to do with Jesus’ ministry to the departed spirits of the dead. None of the Gospels mentions it directly. But hints lie all across the New Testament. As Albrecht Oepke writes, “That a journey to the lowest regions [by Jesus] preceded that to the upper is seldom emphasized in the NT but everywhere presupposed” (see Matt. 12:40; Rom. 10:7; Eph. 4:9; 1 Pet. 3:18–20; 4:6; Rev. 1:18). In Luke’s account, the first hint arises when Zacharias prophesies that the dawning messianic age, to be heralded by his infant son, will bring light not only to inhabitants of this world but also “give light to them that sit in darkness and in the shadow of death” (1:79). These words rest on Isaiah 9:2, a passage that early Christians understand as announcing Jesus’ descent into the spirit world to release the imprisoned souls. A second tip occurs when Jesus stands up in the Nazareth synagogue and reads these words from Isaiah: “The Spirit of the Lord . . . hath sent me . . . to preach deliverance to the captives, and . . . to set at liberty them that are bruised” (4:18). Centuries later, these words inspire Joseph F. Smith to write, when recalling his own vision of the spirit world, that the Savior comes to the spirit prison, “declaring liberty to the captives who had been faithful” (D&C 138:18). Later, he notices that Jesus organizes his “chosen messengers . . . to . . . proclaim liberty to the captives who were bound, even to all who would repent of their sins and receive the gospel” (D&C 138:31). A third clue lies in Jesus’ instructions to Simon Peter after giving a sermon out of his fishing boat. He commands, “Launch out into the deep and let down your nets for a draught” (5:4). Often, the term “the deep” or “the depth” (Greek bathos) in the Septuagint raises the specter of the sea, often a place where the dead are to be found. But in a remarkable passage, Isaiah writes that the deep is to become a path of rescue, “a way of passage for the delivered and redeemed” (LXX Isa. 51:10). The Apostle Paul mirrors this notion, noting that Jesus’ post-mortal work will have something to do with “the deep” (Rom. 10:7; Greek abyssos). Further, Ezekiel writes that those in need of redemption, as personified by Pharaoh and his dead warriors, reside in the depth (see LXX Ezek. 26:19–20; 31:14–15, 18; 32:18–21, 24). Hence, Jesus’ reference to “the deep” draws up both the doctrine of redemption and his role as redeemer, not only for those in this world but also for those in the world to come (see the note on 5:4). A fourth instance stands in Jesus’ warning words about evil influences on families (see 11:17–26). In one saying, he describes “a strong man” whose “goods are in peace.” Then “a stronger than he” comes along and pushes him out of “his palace,” taking “from him all his armour” (11:21–22). All commentators agree that, in this scene, the “strong man” is the devil and the “stronger” is the Savior. Now to the key point: the “goods” of the “strong man” are the captive souls whom Jesus rescues from Satanic influences, whether in this life or the next (in my commentary, see the notes on 11:21–22; the Analysis on 11:14–28). Thus, in this passage we come upon a clear allusion to Jesus’ work among the spirits of the dead. What have we seen in this brief, limited review of Luke’s presentation of his master? First, we learn that individuals matter to the Savior. For example, he singles out the poor widow in the temple for his followers, drawing attention to her among the crowds and setting her apart from those who catch the eye of temple authorities with the sizes of their gifts. She matches his words that “The life is more than meat, and the body is more than raiment”; and “a man’s life consisteth not in the abundance of the things which he possesseth” (12:23, 15). Looking at her, he knows that she has “cast in all the living that she had” into the temple’s offering chests and thus, truthfully, “Solomon in all his glory was not arrayed like [her]” (21:4; 12:27). Second, Jesus’ kingdom is for all. Men and women and children stand on the same ground. Jesus visually demonstrates this, for instance, by encouraging women to become close followers and by the attention that he pays especially to women in difficult legal and social situations. And Luke faithfully passes this portrait to us, his readers. One example will suffice, one that I have not examined this morning. On one day, Jesus is in Capernaum healing a centurion’s servant; the next morning, he is in Nain, almost thirty miles away by foot, to meet the funeral procession for the only child of a widow (7:1–16). He knows this woman’s plight, that she stands in a very difficult circumstance. He comes to help. But he must walk through much of the night to reach Nain, uphill. The lesson for us? He makes an enormous physical effort to help this distressed woman and thus demonstrates to his followers his unbounded love for this widow whom neither he nor they have ever met. Hence, he shows the truth of his saying, “how much more are ye better than the fowls” (12:24). Moreover, he underlines that this woman bears an intrinsic value that is equal to “Solomon in all his glory” (12:27). Third, the Savior’s celestial concerns do not reach out and touch us in this life only. They feel after us even after we pass through the veil of death. The hints in Luke’s record that point to Jesus’ activities in the spirit world while his body lies in the tomb of Joseph of Arimathaea, coupled with statements that we find elsewhere in the New Testament, especially in Peter’s first epistle, elucidate a part of Jesus’ ministry that receives little or no attention among our fellow Christians (Matt. 12:40; Rom. 10:7; Eph. 4:9; 1 Pet. 3:18–20; 4:6; Rev. 1:18). Yet this doctrine’s presence in Luke’s Gospel and elsewhere underscores its unending importance. Consider the lilies? Yes. How do they grow? In the radiant colors of Galilee’s spring flowers, constantly renewing themselves as Jesus’ teachings do for us. Thank you. Botterweck, G. Johannes, Helmer Ringgren and Heinz-Josef Fabry, eds. Theological Dictionary of the Old Testament. 15 vols. (Grand Rapids, MI: Eerdmans), 1974–2006. Falk, Ze’ev. Hebrew Law in Biblical Times. 2nd ed. (Provo, UT: BYU Press; Winona Lake, IN: Eisenbrauns), 2001. Fitzmyer, Joseph A. The Gospel According to Luke. The Anchor Bible. 2 vols. (New York: Doubleday, 1981), 1985. Theological Dictionary of the New Testament, 1:215; Plummer, Luke, 4; Marshall, Luke, 42–43; Fitzmyer, Luke, 1:296–97; Johnson, Luke, 28. Stein, Luke, 376, footnote 156. Theological Dictionary of the New Testament, 1:650–51, footnote 15. Theological Dictionary of the New Testament, 1:656; Theological Dictionary of the Old Teatament, 8:19; Falk, Hebrew Law in Biblical Times, 138–40. S. Kent Brown, “Family and Home in the Savior’s Life and Ministry,” in To Save the Lost: An Easter Celebration, ed. Richard Neitzel Holzapfel and Kent P. Jackson (Provo, Utah: BYU Religious Studies Center, 2009), 21–33; “The Savior’s Compassion,” Ensign 41 (March 2011): 51–53. Theological Dictionary of the New Testament, 2:424. The Gospel of Nicodemus, 17.1, in New Testament Apocrypha, 1:471; S. Kent Brown, Richard Neitzel Holzapfel and Dawn Pheysey, Beholding Salvation: The Life of Christ in Word and Image (Salt Lake City and Provo, Utah: Deseret Book and BYU Museum of Art, 2006), 91–93. Theological Dictionary of the New Testament, 3:399–401; also 1:146–49.